Buy Wanted: Dead or Alive on DVD! 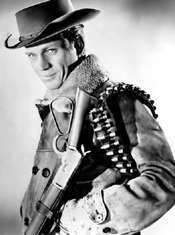 Josh Randall (Steve McQueen) was a man of few words. A bounty hunter by trade, he tracked his prey all over the West. 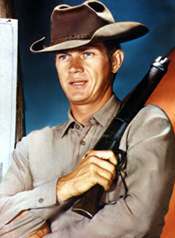 Randall carried an 1892 44/40 center fire Winchester carbine that he called “Mare’s Laig.” It handled like a revolver by had the punch of a rifle. Unlike other bounty hunters, Randall had scruples. He tried to bring the prisoner in alive and often found himself called upon to protect people in need. 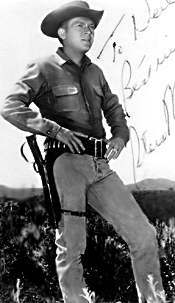 In 1960 the character of Jason Nichols (Wright King) was added to help Randall out. 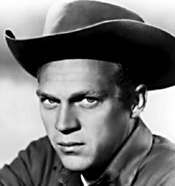 The show made a star of Steve McQueen, who unlike many Western stars, would go on to a memorable film career. 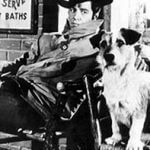 TV Guide’s Wanted Dead or Alive Page, with TV Listings, Photos, Videos, Exclusive News and More. 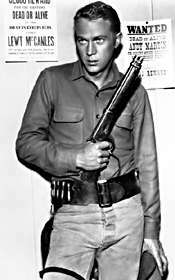 Did you know that Steve McQueen was the first choice for the role of Butch in Butch Cassidy and the Sundance Kid? Negotiations broke down over billing. 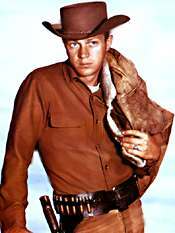 Did you know that the character of Josh Randall was introduced in an epsiode of Trackdown? titled “The Bounty Man” (3/7/1957).